The 2016 Nissan Quest minivan offers clever features such as a bird's-eye-view camera system and power-operated 3rd-row seat, while base models undercut the Toyota Sienna and Honda Odyssey in starting price. Where the Quest stands apart is in looks - decidedly blocky vs. rounded, and in seating capacity, with room for only seven instead of eight. 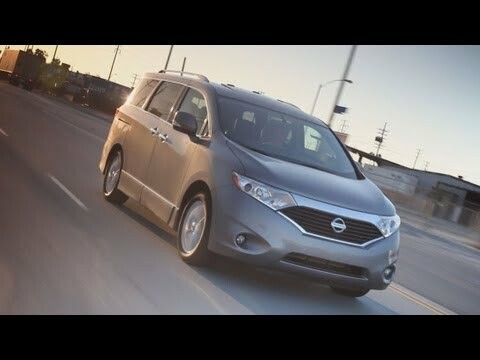 Nissan Quest is the best! My Quest is an extremely comfortable vehicle. It seems more spacious than some other minivans which helps to make it more comfortable. I like that it has heated seats, navigation, sound system and DVD player. Even with the third row there is still a lot of room in the back to store things or put groceries. There is an underneath compartment in the back that I put some groceries so they do not roll around or get smushed. We have had no issues with the Quest it runs great and smoothly. We love it and would never go back to a different vehicle. The Nissan Quest is a fantastic, reliable, spacious family car with wonderful storage options! I love this minivan because it drives like an SUV! Very smooth, turns great, and has been extremely reliable. We have had no problems with it since the day we purchased! The interior is super spacious, we love the extra storage space in the trunk and being able to fold down the seats in the back makes hauling large loads a dream! Especially whenever we go out of town! The only downside with this car is that there isn't as much leg room as one might want in the very back seats, but people still fit back there just fine! The 2016 Nissan quest is very comfortable, the 7 seats allows for my kids and my parents to relax and stretch out for each of our car rides. My son loves the accessibility of all the cup holders and storage bins. For myself, the back up camera is very reliable and easy to use. The little inlet below the screen allows me to place my phone there so I can use it for directions. The easy to read dash is helpful especially if there is something wrong with the vehicle.